A business trip to San Francisco presented me with another classic incidental wildlife spotting opportunity. I had read about the legendary Pier 39 and the California Sea lions that spend their days sunbathing there, so I tagged a weekend on to my trip, and after a great day of photographing hummingbirds in Golden Gate Park, I headed down to Fisherman’s Wharf and the pier. As I approached, I spotted the swarming mass of noisy, sweaty, smelly bodies, jockeying for position. This was just the tourists on the pier, though! As some of the crowd dispersed, I made my way to the front. I don’t like to be in the middle of tourist groups, and actively avoid it where possible, but in this case it was understandable. Here in the major city that is San Francisco, I found over 200 sea lions lazing around in the sun, in one of the central tourist hubs. Sea lions have external ears that are visible in these photos. Seals do not have ear flaps. Seals are less comfortable on land and crawl on their bellies as opposed to walking on front and rear flippers. Seals generally only come together in groups for breeding. 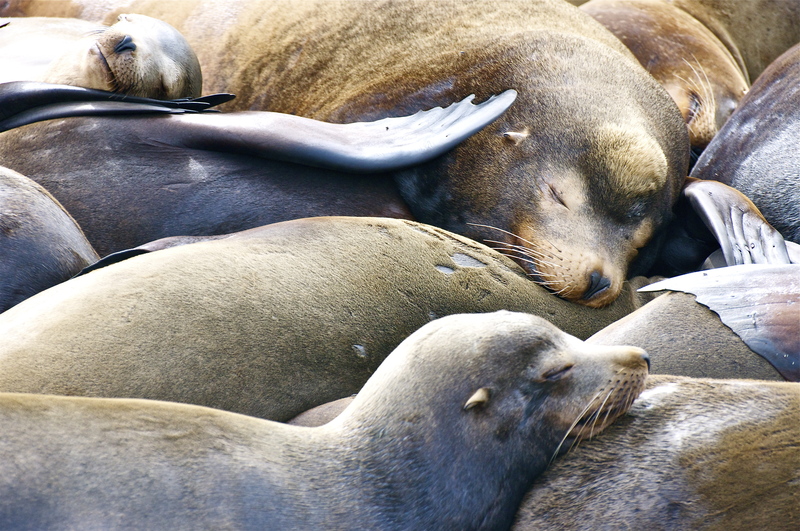 Sea lions live in large social groups. Back at Pier 39, at the place where thousands of people queue, daily for crab rolls and clam chowder, or file on to boats for the daily commute to Alcatraz Island, sea lions lay in the warm sun, digesting their fish supper, oblivious to human activity. The peace is broken when a female drags her body up on to a platform and an argument for position breaks out. With the lumbering, 7ft long (2m) males reaching up to 850 pounds (390 kg), these noisy disagreements are quite a sight. 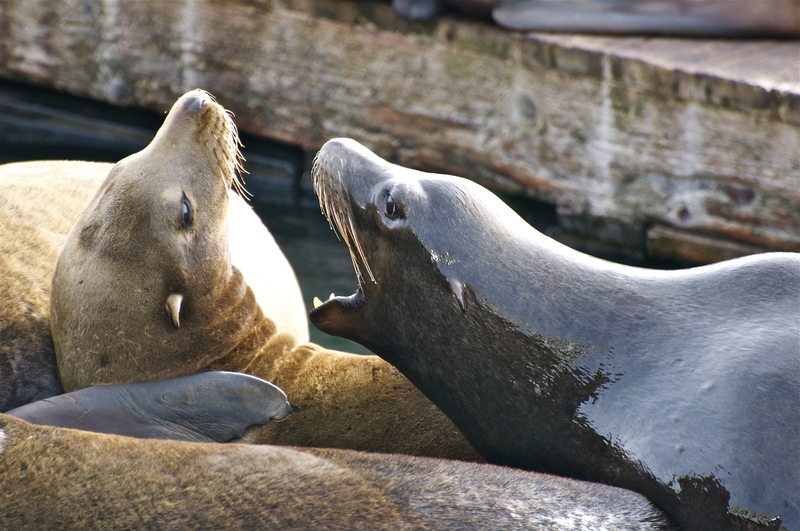 The sea lions have made Pier 39 their home since 1989. There is speculation that this was due to a bumper herring run in the area, but nobody knows for sure. A peculiar aspect of their behaviour is that periodically, without warning, they all disappear for a few weeks. Regardless of whether they are of breeding age or not, every sea lion vanishes at the same time. This happened in 2009 and again in 2014. There have been many theories from scientists, biologists and others, but it appears to a layman like me, that the actual reason for the disappearance remains as much a mystery as their arrival. A year later I found myself on another business trip to San Francisco. This time I wanted to see the area outside of the city so I decided to stay for the weekend. I hired a car and joined the Friday evening procession for the 3 hours drive south to Monterey Bay. I arrived in Monterey late in the evening and the east west time difference helped me fall asleep quickly, ready for an early morning whale-watching trip. The alarm rattled me out of bed. I threw on some clothes and walked down to the wharf at first light. I could hear the barking of sea lions as I got close to the water. Here in Monterey Bay, the California sea lions live in large, noisy colonies, throughout the winter months. The sea lion colonies are primarily made up of young males, although a few females appear in the group. I saw these beautiful, smelly, noisy creatures reclining on rocks, buoys and boat docks as well as torpedoing powerfully through the heaving water of the bay. One of the most enjoyable experiences was watching the sea lions play at the end of the rocky breakwater at Monterey harbour. But for me the highlight of my sea lion encounters occurred at the harbour of Elkhorn Slough, 20 minutes north of Monterey. It was here that a large floating ball of sea lions rolled, knitted together, in a noisy, curious, tangled raft, towards this nosy photographer, sitting quietly amongst the rocks, stained and stinking of pelican poo. Monterey bay and the Big Sur coastline is an extraordinary place to watch California sea lions as well as experiencing a host of other marine life encounters. But if time prevents the journey south, and you find yourself in San Francisco, I recommend a trip to Pier 39. If you can’t make the trip, why not check out what you are missing on the Pier 39 Sea Lion Web Cam, which points at the floating platforms, inundated with sea lions, within the confines of the harbor wall. Love your images. They are more intimate than the casual, “touristy” images one usually sees. Thanks for the tip! Combination of description and photos put me in the scene. Comedic tourist line much appreciated! M.O.M. Amazing photos! They are so cute! Where I live you can get woken up by sea lions if you are camping. It is oddly satisfying. Such majestic aqualine creatures… how they’re built for cleaving through the water. Their weight is impressive too. I like that they have muscled in on a built up Pier area. Here in Cape Town’s inner harbour the Cape fur seals are at home too. A nice sheltered area where they make good use of sunning themselves on the lower floating docks, and now some areas are set aside for tourists to take good close-up photos through clear glass barriers. I have seen the fur seals at Cape Town in 2003 (great city) and would love to go back to see them again. It is fantastic to see these creatures in such public places, without a care in the world. David, great photos here! Your post made me smile. 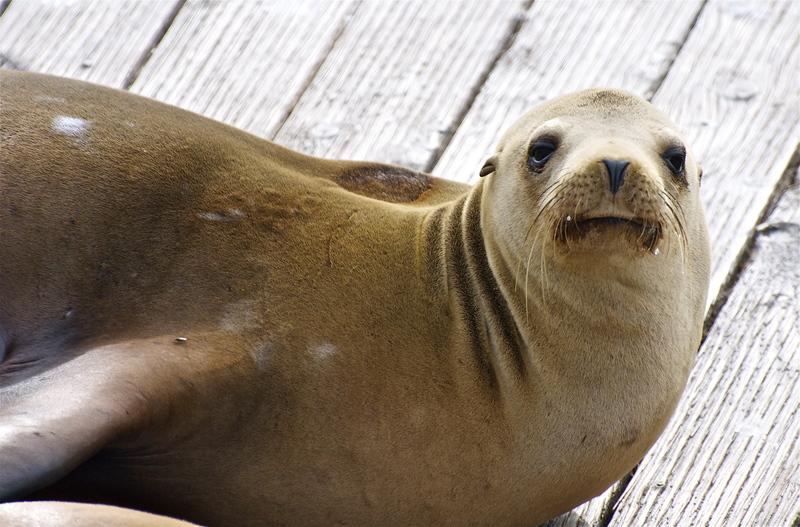 We have California Sea Lions in Astoria, Oregon, too… some consider them a nuisance, but I love them. Beautiful. Loved the videos. They are so much fun to watch. there is a good place to see them on the 1 highway road from San Francisco heading towards Santa Cruz. I cannot remember the name of the beach but they all lounge there in the sun especially during molting season. Lovely lovely post! Thanks for the comment! I have to visit San Francisco from time to time for work and I can’t resist adding a wildlife trip on to the visit. I’ll look out for the Sea lion beach. Thanks for the tip! I’ve been to Pier 39 and my favorite thing to do there is to watch the sea lions. One time I watch two fight for the same spot even though the rest of the pier was empty. That sounds about right. They are a noisy and argumentative bunch! Loved your recent Sea Otters blog and just happened to see this one about the California Sea Lions…been a long time since I have been @ Pier 39, but what a sight and what a ruckus…loved it. And as always your photography is spectacular! I live in Monterey, about two miles away from the Coast Guard Pier, otherwise known as the Breakwater. There are times, early in the morning, when everything is still and the winds are coming my way, that I can hear the sea lions barking away.